The Israeli Defense Forces has a history of overzealous campaigns on its official social media accounts. 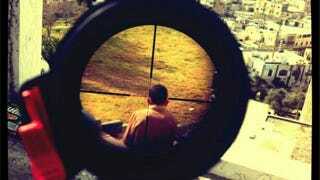 So maybe we shouldn't be surprised that an IDF sniper doesn't take his job very seriously. Or that's the impression we get, since he Instagrammed a photo of what appears to be a Palestinian child in the crosshairs of his rifle scope. Real, real messed up. Buzzfeed reports that 20-year-old Israeli soldier Mor Ostrovkki posted the photo on Instagram and later took it down after it sparked outrage. With good reason! What the hell is this maniac thinking? The Israeli paper Haaretz reports that the IDF has come out against the photo, which, you know, good.